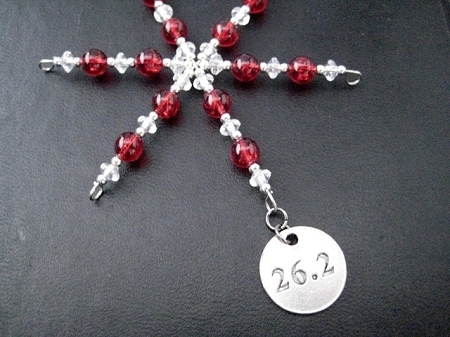 The Run Home's 26.2 Marathon Round Pewter Pendant is available only at The Run Home! The Run Home's Snowflake Ornament / Gift Tag measures 3 1/2 x 3 1/2 inches and is handcrafted out of vintage beads featuring a main bead color of your choice plus vintage clear and silver beads. The Run Home's Exclusive 26.2 Round Pewter Pendant measures 3/4 inch Round and dangles from the bottom. I have purchased one of these for each of my husband's marathons to hang on our tree. Each with a different color. This year I purchased my eighth ornament. Next year I'm going to have to request a custom bead color! Hoping you have some! Thank you for this special tradition!